Awesome Affiliates on the Avenue! One of my favorite things about Empire Avenue is the great community of people. I am impressed daily by the kindness, generosity, and ingenuity I see either through Missions, in our Communities, or the general vibe of support that runs throughout the Empire Avenue. 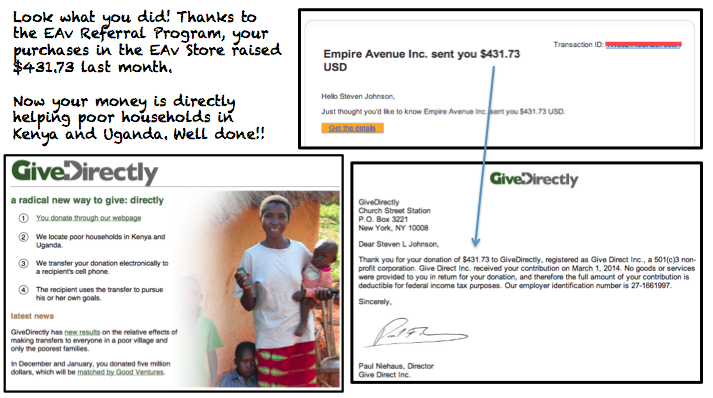 A recent example of the greatness of our community is Steven L. Johnson, better known as PROFJOHNSON on Empire Avenue. Steven is one of our Empire Avenue Affiliates. The Empire Avenue Referral Program allows Empire Avenue users to share a referral link, and make commission from Empire Avenue sales. Steven has decided to do something quite awesome with his commission payment! Rather than me tell you about it we thought we would go right to the source and ask Steven about this decision, and Empire Avenue. Q: How long have you been on Empire Avenue? A: I joined Empire Avenue in July, 2011. Q: Tell us a bit about your use of Empire Avenue and the connections you've made. A: I was originally interested in Empire Avenue as a measurement tool for my online presence. I quickly became interested in the gaming aspects of the social stock market. Overall, though, what I've most appreciated is developing friendships with people around the world with similar interests in social media and related technology. Q: What will you be doing with the money you've so far gained from the Empire Avenue Affiliate program? A: In the first month as an Empire Avenue Affiliate I earned $431.73, all of which I donated to the charity Give Directly. Give Directly targets very low-income households in developing countries. They use an innovative mobile phone-linked payment system to direct transfer cash to households in developing countries (currently, Kenya and Uganda). GiveDirectly.org is a top rated charity by GiveWell.org. It excels in these three criteria: (a) serving the global poor, (b) focused on evidence-backed interventions, and (c) thoroughly vetted and highly transparent. Q: What advice would you give to those coming on Empire Avenue? A: What you get out of Empire Avenue is directly related to what you put into it. There's great potential for networking and learning from others, but that only happens if you put the time into making social connections. Thanks for your time Steven! This is one of the many awesome things happening daily on Empire Avenue! What have you discovered? Be sure to let us know in the comments on in the Empire Avenue General Discussion Community!